The KwaZulu-Natal Philharmonic Orchestra returns to the Durban City Hall for its four-week Late Spring Symphony Season of sublime world class music from October 19 until November 16. There was no concert on Thursday November 26, as the KZN Philharmonic performed in Johannesburg as part of their commitment to working with the JPO doing two concerts on November 26 and 27. 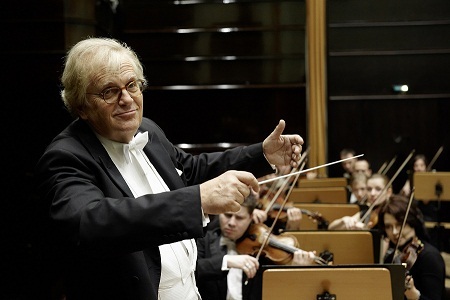 The second concert will take place on November 2 under the baton of German maestro Justus Frantz. The programme is devoted to those tragically short-lived giants of the early Viennese school, Wolfgang Amadeus Mozart (1756-1791) and Franz Schubert (1797-1828). The programme includes Mozart’s Le Nozze Di Figaro Overture and his Violin Concerto No. 5 in A major, K. 219 (Turkish) as well as Schubert’s Symphony No. 9 in C Major, D. 944 (The Great). Performing Mozart’s A Major Concerto will be Polish born and UK raised violinist Rafał Zambrzycki-Payne, winner of numerous prizes including the BBC Young Musician of the Year Competition. Born in Lodz, he studied at the Yehudi Menuhin School and the Royal North College of Music in Manchester and in Vienna. He was the leader of the Frankfurt-based contemporary music group, Ensemble Modern, and he is a founding member of the Dimension Piano Trio, winners of the 2005 Parkhouse Award. Notable career highlights include January 2015, when he performed in front of 300 survivors and dozens of heads of state during the 70th anniversary commemoration of the liberation of the German Nazi Concentration Camp in Aushwitz-Birkenau. The poignant and solemn ceremony was broadcast live on over 250 TV channels worldwide. In July this year, together with the String Quartet of the National Polish Radio Symphony Orchestra, Rafal Zambrzycki-Payne performed before Prince William and Kate Middleton on the occasion of the Queen's birthday party in Poland. The third concert is on November 9. On the menu will be Smetana’s Má Vlast / My Country - a set of six symphonic poems composed between 1874 and 1879; Rachmaninoff’s Piano Concerto No. 2 in c minor and Dvorák’s Ninth Symphony. Soloist is Ukrainian-American Valentina Lisitsa, a Ukrainian classical pianist, and vocal social commentator, who in 1991 emigrated to America, and then to France. She’s risen rapidly from relative obscurity in her 20’s to global media and piano stardom in her 40’s: her website gets hundreds of thousands of hits and her YouTube channel has more than 170,000 subscribers making her one of the most frequently viewed pianists on YouTube – particularly of her recordings of the romantic era composers: Liszt; Chopin and Rachmaninoff. She launched her career on social media, famously without signing with a record company / tour promoter. Refreshments and light snacks may be purchased in the foyer before the concert and during interval. Single tickets are available from www.computicket.com, 0861 915 8000, or from Shoprite Checkers Money Market counters. It is cheaper to subscribe: For subscriptions contact 031 3699438. The morning rehearsals for the early Spring Symphony Season concerts are open to the public and provide a glimpse into the preparation needed for a symphony concert. Join the orchestra each Symphony Season Thursday at 10h00 in the Durban City Hall. Entrance R30 (R10 scholars) includes a cup of tea or coffee during the interval. The final rehearsal is the perfect opportunity to introduce scholars to symphony concerts and also provides great outings for community groups and retirement homes. Contact the KZN Philharmonic to enquire about special rates and to make arrangements for groups. Contact bookings@kznphil.org.za or call the bookings office on 031 369 9438.